A commercial moving company can give you comprehensive assistance in relocating your office. They can give you a better office removal planning insights. But the actual date of the move will stay at your own discretion. You will need to decide when you want to start the transition. If you are doing a considerably-high risk move like a business relocation to Sydney, you might want to do the move on your own. So, pick the best time to move your office and be sure to consider the following factors. During peak seasons, many companies are hiring movers. There is always a tendency for the most commercial moving company to increase their rates too. Obviously, this is due to the fundamental “Supply vs Demand” paradigm of business in a general sense. Hence, if you want to maximise your budget then you will have to move before or after the peak season where rates are lower. There are many removal companies that have excellent customer service. They will be transparent to you about this matter. Also, they can tell you in advance, or you can ask them proactively. Being the best in your field, you are usually busy providing your service. If you’ve hired the best commercial moving company, then you can expect for their schedules to be tight. Hence, as you plan your move. It would be best to inquire about availability before you fire the gun. That means that before you finalise the schedule for the relocation, let the removal team know. Just in case their calendar does not agree with yours, you can make the proper adjustments. Bad weather is a huge setback to a commercial moving company’s operation. It can delay them greatly. Therefore, it would be best to check weather forecasts and observe weather conditions as well. Make sure that nature will not get in the way of your progress. More importantly because, as aforementioned, their calendar can be really tight too. So, in the case that you were just squeezed in, and then you meet a delay due to weather. That would really be the worst contingency your project will meet. It’s not only the commercial moving company that will adjust to your schedule. In fact, ideally, they don’t. Customers, employees and everyone else are going to adjust. And you should give them time to do so. Not to mention the possibility for your enterprise to be forced to come up with relocation packages for your most valuable employees. Adjustments apply to everyone. This is why we’ve highlighted many times on previous blog posts about the importance of preparing way ahead of time. This is for you to see that you will not have to deal with schedule contingencies. Finally, the ultimate factor for you to consider is what’s agreeable to everyone. Especially to all people that are supporting you in this endeavour. The schedule should work for them too. As well as your clients, employees, business partners and easy moving self storage Sydney service provider. Doing so, will secure your success and bring more value to your company. Establishing the move schedule is a big milestone to complete. It can serve as a focal point for progress along the whole relocation endeavour. Many crucial big decisions will depend on it as you move forward. So as you make your final call for the actual date schedule of your move, consider these factors well to ensure a smooth relocation ahead. Explore more on the job insights from the team and browse our services. 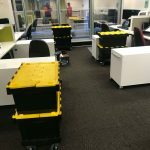 Also, if you need some pointers in finding a relocation site then you may want to check out our posts Office Removal Services Tips: Ensure the New Location Is A Win.